Recycling e-waste (the industry name for electronic waste such as old computers, smartphones, and printers) is great for the environment and can be great for your wallet too. However, unlike with other forms of recycling, when it comes to e-waste you need to be conscious of data security. Common recyclable e-waste such as laptops and phones can be full of personal information. In the area of connectivity that the internet and common digital devices have given us, privacy and security are things you absolutely have to consider. Scrapping a refrigerator is one of the more intricate scrapping tasks, but it can also be quite lucrative. Here are some tips regarding scrapping a fridge safely and legally. The main thing that makes recycling a refrigerator (or an air conditioner, for that matter) difficult is the presence of refrigerant chemicals such a freon. Some of these gases are very harmful to breathe, and virtually all of them are quite damaging to the ozone layer. Because these lines are made of copper, most scrappers want to recycle them, but before they can legally be recycled, an HVAC professional with the right certification needs to drain them. If you have certification or know someone who does, you’re in luck—but if not, you may not be able to fully recycle the refrigerator without paying a professional to do this work properly. However, there are some other valuable parts on the refrigerator! Fortunately, these parts are generally easy to access, and can still be worth quite a lot. Recycling magnesium in Dallas might seem difficult at first, but it’s actually quite easy once you have the right information. It can be very profitable as well! Recycling magnesium is also very important for protecting the environment. It is one of the most recyclable metals, and recycling a material containing magnesium alloy (a metal compound made with magnesium) uses only 5% of the energy it would cost to produce new magnesium alloys. Because magnesium is a widely used material in die-casting, even for structural purposes, it is important that scrap magnesium does not go to waste. Industries that use magnesium do a lot of work to encourage recycling, and many manufacturers that use magnesium actually recycle it themselves. All of this is good for the environment, but recycling magnesium can also be good for you. We do not accept magnesium chips for recycling, as they have been known to spontaneously catch fire. Catalytic converters are important environmental components found in every car sold today. They contain very rare, valuable metals such as platinum and rhodium. These metals consistently fetch very high prices on the recycling market because they are not only rare, but also heavily in demand—especially from the auto industry. This means that stripping and scrapping an old car you legally own can be more lucrative than selling it as a complete vehicle. It also means that the auto industry can continue to acquire these rare metals at more affordable rates, and therefore continue to turn a profit without drastically raising car prices. However, it also means that thousands of people in Dallas, Fort Worth, and the rest of the country (and the world) have their catalytic converters stolen almost every single day. Here are some tips for protecting yourself from this type of theft, and for selling a catalytic converter you legally own. Do you have an old car you no longer need? Have you had work done to your car that’s left some disused parts lying around? Getting rid of a scrap car or auto parts can be easy, and net you a bit of cash to boot, if you take them to a professional recycling center like Encore Recyclers. In addition to taking junk off your hands and getting you paid for it, recycling cars and car parts is also great for the environment. Many car parts contain rare metals, and these metals can often be recovered almost completely—which reduces the environmental impact of mining and keeps the overall supply of these metals higher. However, getting the best value for your car scrap takes a little bit of time and expertise. Your car is made up of a wide variety of components that are themselves composed of a variety of metals and other scrap-friendly materials. The majority of your car’s weight comes from steel, and there is a large amount of other, lighter metals as well (such as tin). The rarer (and therefore more valuable) metals are often used in the moving or otherwise functional parts of your car. If you scrap your entire car, the price at most scrapyards will be based on weight. A scrapyard feels safe betting on your steel, but doesn’t have the time and labor available to fully inspect your car for other metals. If you want the most value for your car, you’ll have to dismantle it. This is generally true of all appliances and machines that can be scrapped. However, dismantling a car is much more difficult than taking apart a washer or dryer or even a computer. Recycling a washer or dryer in Dallas or Garland can be a difficult but rewarding task. Here at Encore Recyclers, we want to help you get the most money for your scrap metal—so here are some tips on how to get the most out of an old or broken washing machine or dryer. Should you dismantle a washing machine or dryer before scrapping it? Taking a washer or dryer apart is no easy task, but many scrappers think it is worth the effort. At Encore Recyclers, we take in both dismantled and complete washers and dryers regularly, and we can confirm that we pay quite a bit more for dismantled appliances. Therefore, if you’re physically capable of dismantling an appliance like a washer or dryer, and if you have or can easily acquire the tools for doing so, it will always be worth the effort. What are the advantages of dismantling an appliance before scrapping it? Although most scrap metal recycling companies accept all forms of metal with a few exceptions (usually for safety or legal reasons), companies in the scrap metal recycling industry do not and cannot pay the same amount for different types of metal. This is because some metals are rarer and/or more useful in manufacture than others. For example, aluminum is a great metal to use in general manufacture, but it is very common and not good for extremely specialized uses. That means that recycling companies cannot pay a huge amount for scrap aluminum. Metals like copper, on the other hand, which are both a little less common and a bit more useful in more specialized kinds of manufacture (such as use in electrical wire), are inherently more valuable. That means that a scrap metal recycling company in Dallas or elsewhere can pay quite a bit more for copper and similar metals. When a full appliance comes into a recycling plant like Encore, recyclers essentially have to estimate what combination of metals will make up the components inside the appliance. Some washers and dryers, for example, use valuable copper in their motors, while others do not. Because estimating the value a given appliance will have is a gamble for the company, they tend to pay a bit lower. On top of that, the company will have to pay employees or contractors to dismantle the appliance—which further eats into your pay. How do you get the most for your broken appliances and other scrap materials? The best way to consistently get the highest value for your broken appliances and other scrap metals is to dismantle appliances and machines and to sort the metals. For example, keep all your steel with other steel, your aluminum with other aluminum, and your copper with other copper. Doing this makes things easier and cheaper for the scrap metal recycler, which means they can afford to pay you more. Having your metals pre-sorted also helps promote worker efficiency and in some cases safety. While it may not be worth your effort to take apart very difficult or dangerous appliances or parts such as air conditioners or engines of any kind, taking apart a washer or dryer may well be within your reach. If you have confidently assembled or broken down furniture, you can probably take apart a washer or dryer as long as you put forth your best effort and remain patient and calm. What are some of the best tips for dismantling a washer or dryer? Although every washer and dryer is a bit different, there are some general tips to follow for successfully dismantling any washer or dryer before selling it for scrap. Do the simplest tasks first. For example, take off doors and covers before getting into activities like stripping wires or taking out a motor. This will give you better access to the inner workings of the machine, and will also give you a sense of accomplishment and motivation to keep going. Sort metals as you work. It’s much easier to sort different metals into tubs, crates, or piles as you work than it is to break the appliance down and do the sorting later. Use online resources. There are many great online resources out there. If you find your appliance’s model number, you can most likely find a YouTube video instructing you on dismantling that particular appliance. There are also great general tips on scrap metal recycling forums. Above all, be safe. Ensure that the appliance is not plugged into power when you begin to dismantle it. Wear work gloves, safety goggles, long sleeves, and long pants. Do not disassemble any parts before you recognize them and understand what they are. Whether it’s a huge rooftop air conditioning unit for a multi-level building or a small portable AC, any kind of HVAC appliance is worth scrapping. However, there are some difficulties with this category of scrap material that stymie many new scrappers, so read on to learn the best way to recycle AC units. There are two major categories for these difficulties to fall into: legal and mechanical. Anyone can solve the legal difficulties with just a bit of time or effort, and most people can get past at least a few of the mechanical problems. Because the legal issues are a bit simpler, let’s look at those first. 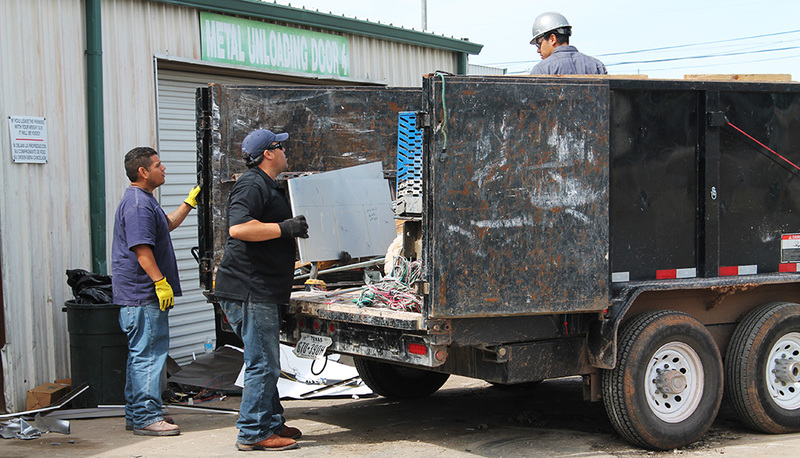 Texas state laws are tough on unscrupulous scrappers who steal metal to sell to scrap yards, and unfortunately these tough laws often end up affecting honest scrappers as well. This is particularly true when it comes to scrap items that are often stolen—a category that air conditioners definitely fall into. If you’re only recycling a single air-conditioner unit, such as one you’ve replaced yourself with a newer model, this shouldn’t be much of a problem. However, some scrappers who work in HVAC or do related activities like refinishing roofs (where many of the largest, most valuable AC units for businesses and apartment buildings are located) want to sell AC scrap in bulk because it can be so lucrative. After you’ve finished a demolition or other project, you may wish to recycle your scrap metal. Scrap metal is not biodegradable, so it’s ideal for recycling. And while Encore Recyclers will buy your metal when mixed together, you may be able to achieve a better price for your scrap by separating out your scrap metals and doing a little prep work, such as removing plastic, rubber, or other contaminants. Read on to learn how to best separate and prep your scrap materials. First, remove any contaminants, such as dirt, plastic, rubber, or other metals. The consumer mills that we sell to in bulk will only take clean, uncontaminated scrap metal that they can put directly into their furnaces. If we receive scrap that is free of contaminants, we are better able to pass the labor savings onto you. Most scrap companies, including Encore Recyclers, will accept entire battery assemblies and entire catalytic converters. Electric motor parts can also be recycled. The field windings (parts with copper wire wound around) should be separated out from the iron and steel for the best price (armatures are very difficult to separate and might need to be chiseled out). The same goes for starters and alternators. Copper or brass radiators from older cars are valuable for scrap; you can identify copper by its bluish-green patina or by scraping the flanges of the radiator and looking for the reddish hue characteristic of copper. Aluminum radiators common in newer cars are not as valuable as coppers ones, but are still worth recycling. Heater cores are brass or aluminum radiators that can be recycled as scrap metal. With all of these parts, you can maximize the value of your scrap by removing pieces of plastic, insulation, and extraneous metals. Iron, steel and other ferrous metals are magnetic. For smaller pieces of metal, you may even be able to lift them out of piles of scrap metal with a large magnet. Stainless steel is alloy containing chromium. It has a dull shine and is heavier than chrome- or nickel-plated steel. Sometimes, it may be slightly magnetic. If you do find stainless steel that’s magnetic, you should add it to your ferrous metals. Should You Take It Apart? 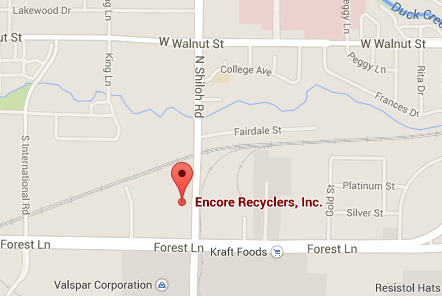 Encore Recyclers on How Does a Scrap Yard Decide How to Price Your Scrap Metal? Encore Recyclers on Should You Burn Your Copper Wire to Earn More Money For Scrap? Clay Chester on Should You Burn Your Copper Wire to Earn More Money For Scrap?